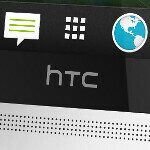 A published report on Wednesday cites a source who says that the eagerly awaited HTC One mini will be launched via O2 in Germany on August 3rd. The unannounced model is a smaller version of the Taiwan based manufacturer's successful HTC One. No pricing information was leaked by the source. Earlier this month, we showed you a picture believed to be of the mini, flanked by its big brother. The HTC One mini is expected to come to market with a 4.3 inch screen with resolution of 720 x 1280. That works out to a pixel density of 342ppi. The phone should be powered by a dual-core 1.2GHz processor and feature Beats Audio, an UltraPixel camera and BoomSound speakers. If there is one bit of irony, despite the slightly reduced specs, the mini has Android 4.2 under the hood, with an improved Sense 5 UI on top. The HTC One currently runs with Android 4.1.2 installed although an update is due. In the U.S., we have heard from our source that the HTC One mini is coming to AT&T and earlier information hinted at an August launch, which dovetails perfectly with the speculation about the O2 release. Another U.S. carrier where we expect to find the handset is T-Mobile. Besides the smaller version of the phone, there is expected to be a phablet-sized model, currently code named the HTC T6. This unit is rumored to be the first smartphone to be powered by Android 5.0.